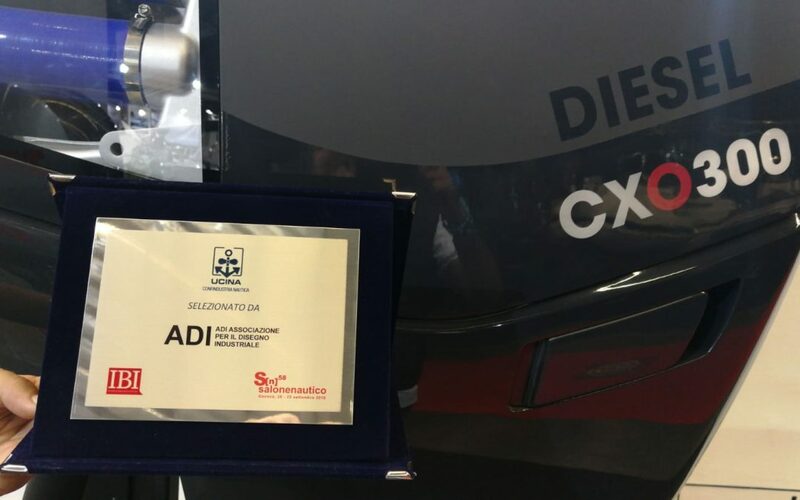 Lancing, UK, 1st October 2018 – Cox Powertrain, the British diesel innovator behind the world’s first 300hp diesel outboard has won the ADI (Industrial Design Association) award for its game-changing engine, the CXO300. The Industrial Design Award is promoted by the Italian Nautical Industry Association (UCINA) and the Italian Design Association (ADI). The award is a great accomplishment for Cox Powertrain who will be launching the CXO300 in November at this year’s Fort Lauderdale International Boat Show. The characteristics taken into consideration by jury panel for the award is the design, the quality of the material used, and the innovation. The CXO300 engine was considered by the jury as the only engine deserving of the award chiefly because of its fascinating design and cutting-edge and sustainable technology. The final concept of the CXO300 is based on the proven technology of a 4-stroke, V8 architecture. It offers at least a 25% better range compared to a gasoline outboard and is designed to last up to three times longer. It has a package volume, around half that of a state-of-the-art diesel inboard with comparable fuel efficiency. It has a 100% higher peak torque at the crankshaft than the leading gasoline 300hp outboards and is 60% higher compared to a leading 350hp. The engine will be sold by more than 40 exclusive global distributors and 400 dealers covering 60 countries worldwide to ensure that the highest level of customer service is delivered.